Both teams put high importance on stability in build up play. Both teams had well-coordinated pressure on defense, though Southampton was on a higher level in terms of their pressing. Both teams used their forwards in a narrow and combinative manner, but there were certain differences that led to Southampton’s victory on the day. Everton used Barkley and Naismith in the wide-midfielder positions. These 2 moved inside very narrow next to Lukaku and Eto’o. Eto’o played quite vertically from his central position behind Lukaku, as was expected of him. The main strategy of Everton was to use this narrow front line to overload central areas and use that overload in order to combine and penetrate the Southampton defense. Southampton had a somewhat interesting approach to this Everton strategy. Southampton’s 3 central midfielders pressed Everton’s fullbacks, while Southampton’s wingbacks oriented on Everton’s wide players – creating a very narrow back 5. This meant that breaking through the back line would be quite difficult due to the high number of defenders in the central area Everton looked to overload. As a result Southampton’s midfield numbers were low. Everton used their usual backline overload with Barry dropping towards the left of the central defenders to form a 3 vs. 2. Instead of playing through the compact center (where Southampton had excellent backwards pressing from the forwards as well) Everton had to play the ball wide. Southampton pressed quite well in wide areas but there was a slight delay due to the distance that had to be covered by the central midfielders. These type of movements stretched the Southampton midfield. Due to this variation in build up play, Everton played a lot of diagonal passes from wide areas into their narrow forwards. Everton controlled the rhythm of the game through their focus on Martinez’s possession philosophy and Southampton’s passiveness in higher areas of the field. Though they still had difficulty penetrating and creating great chances when it came to the final 3rd against Southampton’s back 5. Once the ball reached the front line of Everton, they struggled in the high pressure and high numbers area – even if they had talented combinative players like Barkley. There were interesting moments when Barkley or Baines would receive the ball from deeper areas and make a run through Southampton’s press and inside from wide areas. 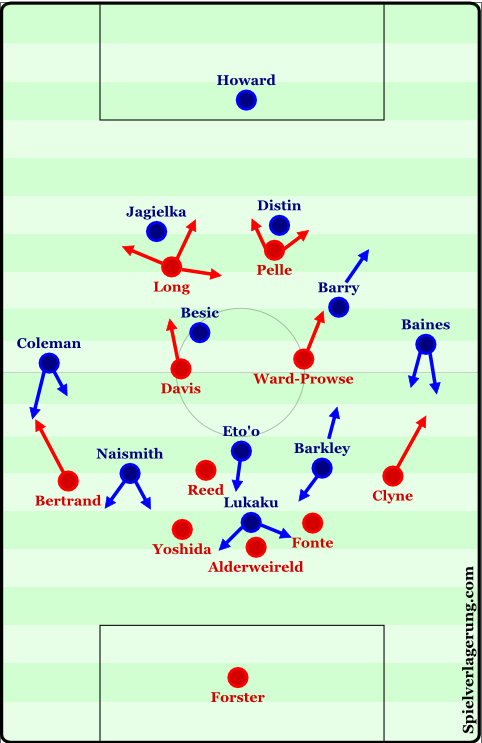 In those scenes Barkley and Baines used their impressive dribbling abilities to break through Southampton’s lines and also combine with teammates to overload small local areas. Though these drives eventually ended up being pushed wide or there was a breakdown in the attack. Though this seemed like a promising strategy for Everton that wasn’t revisited throughout the match. Southampton also looked to play into their forwards who were supported by their double 8s in a narrow and combinative manner. Though Pelle in particular struggled to play accurate lay-offs and combinative passes like 1-2s. The Saints used their wingbacks very high up the field and used their overload out of defense to create an open man who could play vertical passes into the forwards. Everton pressed in a 4-4-2/4-4-1-1 with Lukaku and Eto’o up front. They had man oriented defense in midfield, including Eto’o. While Lukaku would just press the near side central defender. Due to this strategy in defense there were 2 big tendencies that arose in the Southampton offense. Because Southampton had many man marked central players, the center became congested. This forced Southampton to occasionally move into wide areas where there was less pressure before they played inside from the flanks. Similarly to how Everton had to build up. Another tendency that arose was Southampton using their overload in the back line and then manipulating the defensive positioning of Everton’s midfield man-markers in order to open passing lanes into Pelle and Long. It was interesting to see the influences of Cruyff and Barcelona in this match. Koeman played for Cruyff while Roberto Martinez played in Spain and is heavily influenced by the Spanish style of play. Both coaches used principles of Positional Play to help stabilize their teams. Southampton scored off of two set pieces, one of which was a Lukaku own goal. Pelle’s goal came from a very long cross by Clyne which was knocked down by Long for Pelle to tap in. These weren’t exactly very efficient means of generating chances, but they resulted in goals nonetheless. Overall the scoreline is probably a bit harsh on Everton. This was a game full of pressure in central areas and both teams trying to break through the central areas in similar ways. This created a game where both teams had trouble creating chances in open play, but in the end Southampton took advantage of their very limited chances while Everton weren’t so lucky. Southampton is currently 4th in the Premier League while Everton is 13th, this is a big difference between the more successful teams in Europe and those who are unsuccessful.